Former presidential candidate, Álvaro Noboa, responds to actions the IRS is taking against him regarding tax issues. Guayaquil businessman Álvaro is defending himself via litigation against the Internal Revenue System’s (IRS) claim for $90 million dollars in back taxes. Moreover, the former presidential candidate of the country claims to be a victim of political persecution. Experience. 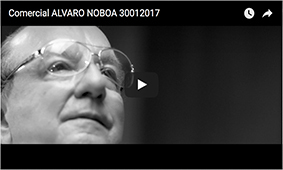 Three-time Presidential candidate and head of NOBOA Group with more than 100 companies. Point of View. State regulatory bodies should allow Bananera Noboa to defend itself in court. The Court of Justice decided in favor of the IRS giving the go-ahead to collect US $90 million in taxes from Exportadora Bananera Noboa. Why don’t you want to pay those taxes? Bananera Noboa’s lawyers informed me that they are requesting permission from the members of the National Court of Justice to show that the IRS are wrong in charging the amount mentioned; and that the whole matter is unjust. If one can’t go to court in one’s own defense, then what kind of Ecuador are we living in? Why, then, does the IRS believe the banana exporter evaded paying taxes in 2005? We believe that this is political persecution; and we want to finally put an end to it all. How is it possible that the other companies that export more bananas than Bananera Noboa pay US $250,000 and the US $90 million due in taxes do not apply to them? IRS Director Marx Carrasco said they are going to freeze Bananera shareholder bank accounts, and even to seize assets if necessary. Does this also include your accounts, as company owner? I haven’t heard any statement from Marx Carrasco about seizing my accounts; only Exportadora Bananera Noboa’s accounts. But you are one of its main shareholders. I’m neither a legal representative nor a shareholder of the Exportadora Bananera Noboa. The company was founded by my father, Luis Noboa Naranjo, 50 years ago and was inherited by other relatives of mine. It is important to save this company because it is a pioneer in opening new markets for Ecuadorian banana producers. The IRS also announced they were going to charge Bananera Continental (Banaconti), the company that took over the operations left by Bananera Noboa, in the case they don’t find any assets or money in the accounts. This question should be asked to Bananera Continental’s managers specifically. In addition, the IRS is investigating other companies in your group for an amount of more than US $200 million. How are you defending yourselves? It is expected that, here, too, justice will be done and that the company is given the same treatment as its competitors, which carry out the same volume of export here in Ecuador. We can’t continue to be the scapegoats. In spite of your trial with the Revenue Service, will you continue investing in the country? I’ve made sacrifices and I’ve always helped the poor. That’s why I’ve been punished via political persecution aimed only at destroying a company founded by my father. But do you plan to keep investing in Ecuador? The work must go on, but obviously, there is that attracts me to continue working in Ecuador. I have also heard of many other business people in the country who have suffered political persecution, who have cancelled their investments, and even closed their businesses. That is not what the Ecuadorian economy needs.